Over the years we’ve moved nearly all of our shopping to Costco. We’ve been going for so long that many of the regular employees know our kids by name. I’m admittedly a fan boy of Costco as we can get nearly everything we need there. Aside from a few produce items and shopping on Amazon, we do all our shopping at Costco. Since we buy so much there, we’ve been able to not just save money but make money shopping at Costco. Many think that you only need to shop at Costco if you want 10-gallon buckets of pickles or enough boxes of mac and cheese to withstand a nuclear winter. Sure, many of the items are in bulk. But, there are many other ways to save money at Costco that don’t require buying massive quantities and in the right circumstance, you can even make money shopping at Costco. I’ve been able to learn about some of the best Costco hacks thanks to a friend who has worked for the company for years. Here are some of our top Costco savings hacks that help us save on our shopping needs. 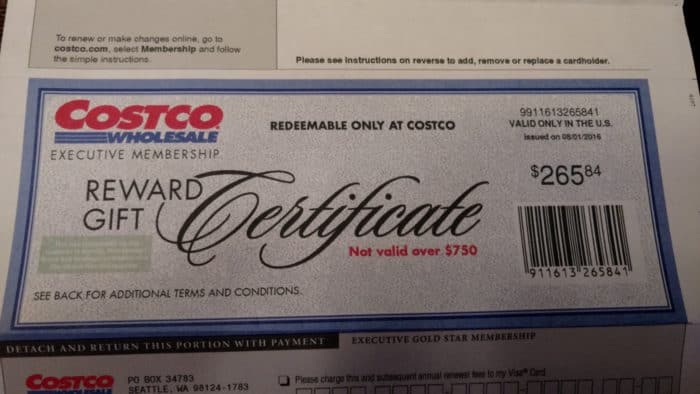 One of our favorite money saving tricks at Costco is buying discounted gift cards. I’ve seen it vary by Costco, but our local Costco has dozens of discounted gift cards from restaurants, movie theaters, travel and more. It varies from gift card to gift card, but most I’ve seen are at least 20 percent off the standard price. When I was on Nutrisystem, I regularly bought Nutrisystem gift cards for 20-40% off standard price. That resulted in a huge savings off the standard price. When I had a few left over that I didn’t need, I was able to sell them at a minor discount on Ebay and net some profit in the process. This is probably my favorite Costco money saving hack. The standard Costco membership is $55 per year though you can upgrade to an Executive status for $110. I know that seems steep, but it comes with an upside. You can earn two percent cash back on all purchases, up to a rebate of $750 per year. As you’ll see in the picture below, we just got our check and were pleased to see that it was a little over $265 for the year. In addition to the cash back you also get further discounted prices on various Costco services. If you don’t make enough back to cover the additional $55 you can ask customer service to refund the difference and lower your membership level. After paying for the membership fee, we still netted $155 – not bad! In addition to offering quality products at good prices, Costco paid us to shop there. That’s a pretty good deal in my opinion. Costco sends out monthly coupons to all members. In years past you needed to either have the coupon or the Costco app to get the discount. That is no longer the case. As you walk throughout the store, you’ll see discounted items marked, so the coupons aren’t necessary – though we use them to plan out our shopping trip each week. Coupons aren’t the only way to save money at Costco. 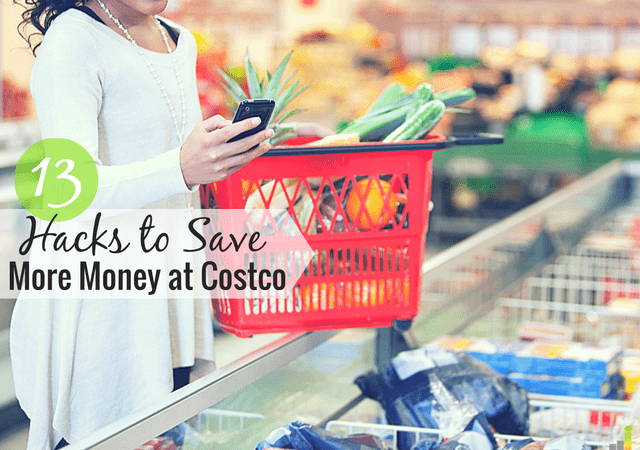 You can also use the Ibotta app to save money at Costco. When you finish shopping, you simply scan your receipt into the app and it matches what you bought against cheaper offers, allowing you to pocket the difference via payment to a PayPal or Venmo account. Ibotta even gives you $10 just for signing up! If you’ve ever walked the entire store at Costco, you’ve noticed a few things. The first thing is that they rarely keep everything in the same location. The reason for this? They want to keep you in the store longer, so you buy more. The other thing you may or may not have noticed is Costco pushes a lot of their non-discounted or higher priced items towards the middle of the store – or Action Alley as they call it. In some instances, a company may even pay more to be in the middle of the store because it’s highly trafficked. If you want to save money at Costco, stay on the perimeter of the store. One of the lesser-known hacks to save money at Costco is booking travel. You can book virtually anything you want vacation wise from cruises and rental cars to theme park tickets and vacation packages. We’ve not price compared, but whenever we book a rental car, it’s almost always from Costco. Their prices are almost always cheaper, and they extend free second driver on all rentals, with no mileage limits. Many know about the generous Costco return policy. You can return most anything if it’s not acceptable to you. The major outlier is on electronics, which has a 90-day window to return items. However, what happens if the price drops a few weeks after buying an item? Costco doesn’t have an official price drop policy but if they drop a price on an item you bought within 30 days, and you still have the receipt, take it to the customer service desk and they’ll commonly refund the difference. Is the $55 membership fee a bit too much for you but you would jump at a lower price? At least in Omaha, they’ll run specials on Groupon or Living Social where they offer a $20-30 discount on the annual membership. Just keep in mind you’ll have to pony up the full price in a year if you choose to renew your Costco membership. You may not realize this, but you don’t have to be a member to get prescriptions from Costco. This isn’t dependent on Costco’s policy, but as required by federal law. For those who are members, Costco has the Costco Member Prescription Program that offers discounted prices on many prescriptions. Costco does require you fill out a form to get this discount, so make sure to ask your local store to enroll in the program. We’ve moved to buying as many organic groceries as possible. We take our health seriously but buying organic can definitely be more expensive. Thankfully Costco has started to carry a lot more organic options over the past few years – at least in our local store. They’re more expensive than the non-organic option, of course, but seem to be about 10-15 percent more, so it’s not too bad and still cheaper than we find at the local grocery store. Costco notates organic items with a green price tag vs. the standard white, so make sure you look before you buy. An item ending in $.99 means that it’s a regular member price. An item with an asterisk * in the upper right-hand corner means it’s not going to be reordered. It may have been a seasonal item, but will not be around for much longer. An item ending in $.97 means that the item has been marked down by the manager and likely will not be reordered. Odd pricing, such as ending in $.59, $.69, etc. is a specially priced item. These may be discounts from the manufacturer given to Costco. An item ending in $.88 or $.00 are items marked down by the manager meant to sell the item fast. Something our friend has shared is that Costco is very aware of the overall cost. They want to pass on the best deals to members, so they regularly play with pricing to move items. Just as with the prescription savings above, you don’t always need to be a member to buy alcohol at Costco. Again, this is dependent on state law as some states don’t allow membership clubs to prohibit alcohol sales to non-members. If you’re in such a state, just tell the greeter you’re there to buy non-member items, and you can buy those items. As you can imagine, alcohol is usually quite a bit cheaper than at other stores. When you buy electronic items from Costco – TVs, computers, some exercise equipment, etc., Costco provides free technical support by phone. We’ve had to use this service once or twice and have had great service. Here’s a link describing the program, but you can call in seven days a week, and they can help you with your problem. As an added bonus, Costco extends the warranty to two years on TVs, projectors and computers at no cost to you – you’d normally have to buy a warranty at other stores to get the same benefit. One area Costco provides non-members savings in is providing access to both optical exams and hearing screenings. If you need to buy an item as a result, you’ll need a member to buy the item for you. Costco also provides members savings through free health screenings. It varies by state and store, but Costco offers heart and diabetes screenings, amongst others, at no cost. Costco also provides savings on other health-related needs, such as flu shots at a discount. We typically get a $10-15 discount per flu shot vs. getting it elsewhere. That adds up with a family of five! 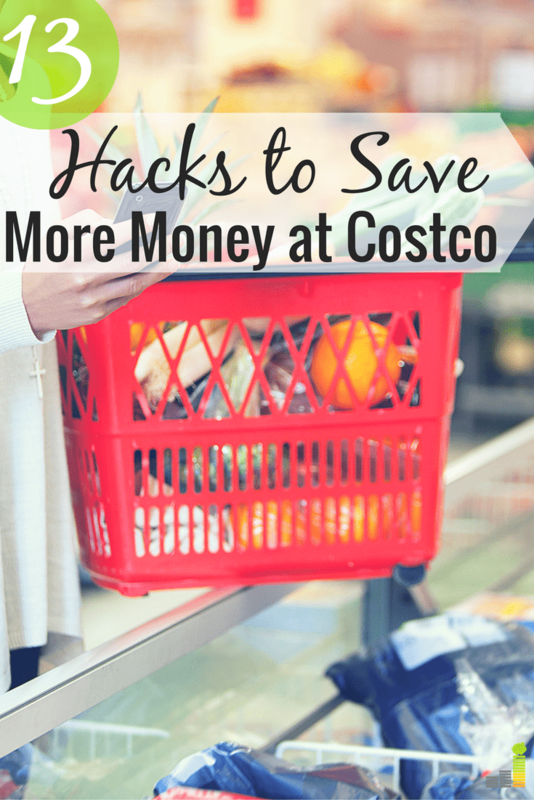 The final money saving hack for Costco is to shop online. The Costco website and app commonly have deals not available in the stores, and you can use any card you like, not just a Visa card. We’ve bought numerous items on the Costco website in the past as a way to save money when we couldn’t find a similar deal in the store. I wish Costco was closer to us. It’s about a 25 minute drive, so we’ve never joined. I don’t think I could justify the drive! Yea, it likely wouldn’t be worth the expense in that case. Interesting, especially about not having to be a member for prescriptions. Costco here is a pain for us to get to, so we joined BJs but a lot of the same tricks work with that. We just haven’t used it very much this year. I am surprised “Buy the gas” wasn’t on your list. That’s one area where we always save money on our warehouse club membership. Yea, I was surprised by that as well when I first learned about it. Good point, but it’s with reason. 🙂 The few Costco’s I’ve frequented tend to be all over the place. Our local one, for example, is usually only a few cents cheaper than other places. Every once in awhile it may be $.10 – $.15 cheaper, which we definitely take advantage of then. Great suggestions for shopping at Costco! I always avoid the middle of the store (but have noticed most people flock there). I’ve found some great discounted items at the end of the aisles and I try to keep an eye on the price codes. We bought a blue spruce at Costco one Fall and it died by the next summer – we took it in and they refunded our money without a receipt. Apparently they can look up past purchases with your membership number. We have as well Amanda. They like to hide things in our store and some times you can score a nice deal. I should’ve mentioned that! We’ve had that happen several times as well. We’ll have something we bought months prior and they can still look it up to give us a refund. I had no idea that there were so many different things that Costco provided. I also didn’t know that you didn’t have to be a member for certain items. Thanks for the tips! Yea, a lot of people don’t know that. Just makes it that much better if you need something that fits under that & don’t have to spend the membership fee. Nice! We went back to Costco for cheaper eyeglasses but now also use them for car rentals. Like you said – better deals than I could find elsewhere. We’ve found the same exact thing to be true, gotta love the savings! Pretty much everyone I know who shops at Costco is obsessed with it. I’m not sure if I should run away because of that or if I should go check it out! I’m a big Target and Amazon shopper and we go to Target once every weekend to stock up on groceries and other things. Lol, fair point DC. I’ve not done an in-depth comparison, but I’ve found that Costco is competitive, if not better, than many things at Wal-Mart, so I’d venture to guess it’d be the same with Target. We love Amazon as well, but have actually found Costco to be better in many cases. The big downside is the bulk in many occasions of course. Five years ago we were looking to take our first cruise. We did some significant shopping/price comparisons and Costco was the least expensive! They made it easy as well. We liked it so much that we booked two more cruises through them! That’s awesome! We’ve not priced out full vacations through them, but have heard great things about their packages and pricing. We started shopping at Costco last year and haven’t looked back. I have a five year old kid and a four month old infant and savings there alone are worth it plus I love filling up my car with Costco fuel. We’re the same way, it helps us save a fair amount of money.